These unique cocktail stirrers are the perfect addition to any party or event. 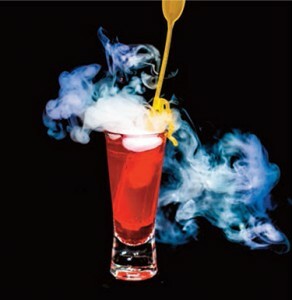 Immediately create an extra wow factor with a dry ice cocktail. 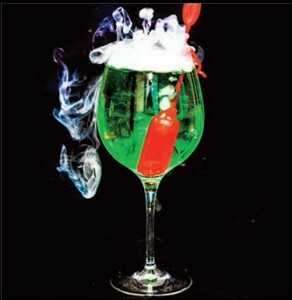 The open/close compartment creates a barrier between the dry ice and the drinker allowing a fun and safe experience. They can also be used as infusion stirrers as a way of introducing other flavours into a drink. Dry ice is solid carbon dioxide (CO2). When placed in a liquid, dry ice will sublimate from solid to gas. Majority of the gas will bubble to the surface and create a mist. A small amount of gas will dissolve into the liquid to effectively carbonate the beverage. The slight carbonation effect is enough to create a tingle sensation. Ironically dry ice does not mix well with carbonated soft drinks or beer. The vigorous bubbling action will substantially un-carbonate the beverage leaving the drink “flat”. Dry ice immediately sublimes into a gas, meaning it is cold enough to chill beverages without watering down and diluting the beverage unlike regular ice cubes. Dry ice is −78. °C .This is extremely cold and can be extremely dangerous if handled improperly without the use of gloves or swallowed. Always ensure dry ice compartment is securely closed before serving. 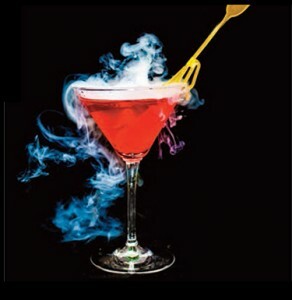 Click Here for inspiring cocktail recipes and remember to add one of our cocktail stirrers for spectacular effects! Dry Ice Supply UK are experts in the dry ice industry and we are able to offer cost effective, flexible delivery solutions as alternatives to more costly refrigeration in addition to always guaranteeing quick responses and reliability. Copyright 2015 Dry Ice Supply UK. All rights reserved.